Team Sky (UCI team code: SKY) is a British professional cycling team that competes at UCI WorldTeam level. The team is based at the National Cycling Centre in Manchester, England, with a logistics base in Deinze, Belgium. The team is managed by British Cycling's former performance director Sir Dave Brailsford. Team Sky launched in 2010 with the ambition of winning the Tour de France with a British rider within five years, a goal achieved within just three years when Bradley Wiggins won the 2012 Tour de France, becoming the first British winner in its history, while teammate and fellow Briton Chris Froome finished as the runner up and then went on to win the 2013 Tour de France, thereby achieving Team Sky's primary aim twice over within the original five-year time period. Froome won Sky's third Tour de France title in 2015, fourth in 2016 and fifth in 2017, as well as their first Vuelta a España title in 2017. Froome then added the team's first Giro d'Italia title in 2018, ending a years-long string of bad luck in that race. They also won the 2018 Tour de France with Geraint Thomas; their sixth Tour in seven years. Following a change of sponsorship, from 30 April 2019, the team will be renamed as Team INEOS. The creation of the team was announced on 26 February 2009, with the major sponsorship provided by BSkyB. The company was searching for a sport in which they could have a positive and wide-ranging impact through their sponsorship. British Cycling first began their relationship with BSkyB in 2008 with a £1 million sponsorship in the Sky Track Cycling team following the Summer Olympics in which British cyclists excelled. After a trip to the Manchester Velodrome, home of the National Cycling Centre, in 2008, BSkyB chairman James Murdoch quickly became keen on the sport. Over the summer of 2008 BSkyB were lobbied by British Cycling and key figures such as David Brailsford and Chris Boardman to launch a British road cycling team which would compete in road cycling's major events. BSkyB agreed to finance the team with the aim of a British rider winning the Tour de France within five years. Initially a supermarket was in talks to become a co-sponsor. Team Sky's original intention was to build a 25-man squad with a core of British riders and to nurture the young talent. The first six riders confirmed were Geraint Thomas, Steve Cummings, Chris Froome, Russell Downing, Ian Stannard and Peter Kennaugh, all British riders. The ambition to "ensure competitiveness" through other signings, including a number of foreign riders, was expressed. On 10 September 2009, a further ten riders were confirmed as set to ride for the team. These were Edvald Boasson Hagen, Thomas Löfkvist, Kurt Asle Arvesen, Simon Gerrans, Juan Antonio Flecha, Kjell Carlström, John-Lee Augustyn, Greg Henderson, Lars Petter Nordhaug, and Morris Possoni. Further additions to the squad, including Chris Sutton and Bradley Wiggins from Garmin-Slipstream, Michael Barry, and Ben Swift from Team Katusha were made before the beginning of the 2010 season. Prior to their first season six jerseys were screen tested to ensure visibility whilst filmed in race conditions. Sky at their first race, the 2010 Cancer Council Helpline Classic in Adelaide, Australia. The team gained a victory in its first race in January 2010, the Cancer Council Helpline Classic in Adelaide, Australia, a one-day race prior to the Tour Down Under, with Greg Henderson and Chris Sutton taking first and second respectively. Team Sky's first ProTour event was the Tour Down Under in January. The team was awarded a wild-card entry for the Tour de France. Team Sky was also invited to compete in the other two of the year's Grand Tours. In February 2010 the team got its first one-day victory when Juan Antonio Flecha won the Belgian semi-classic Omloop Het Nieuwsblad with a solo break. On 9 May Wiggins became the first Sky rider to wear the leader's jersey of a Grand Tour when he won the opening prologue of the Giro d'Italia. That same month Ben Swift became the first rider to win an overall classification winning the Tour de Picardie. In the Team's first Tour de France, Geraint Thomas finished second on the cobblestones of stage three, and wore the white jersey as leader of the young rider classification. The Tour was a disappointment for Sky though, with Thomas Löfkvist in 17th overall being their highest placed rider (Wiggins finished in 24th place). Löfkvist led Team Sky at the Vuelta a España, but the team withdrew after stage seven following the death of soigneur Txema González. In total Team Sky recorded 22 wins in their debut season, with a further 50 podiums. Team Sky's Chris Froome (left) at the 2011 Vuelta a España, where he finished second overall. At the time this was Sky's highest in a Grand Tour. Team Sky again began the season in Australia, with Ben Swift winning two stages of the Tour Down Under, and finishing third overall. Juan Antonio Flecha and Jeremy Hunt finished fourth and sixth respectively in the Tour of Qatar in February, while Boasson Hagen finished first in the points classification and second overall in the Tour of Oman later that month. In the Classics season, Wiggins finished third overall in Paris–Nice and Geraint Thomas finished second overall at the Dwars door Vlaanderen. The team enjoyed a successful Tour of California, with Ben Swift winning stage two and Greg Henderson taking victory in stage three. At the Giro d'Italia, Thomas Lofkvist was the highest placed Sky rider, finishing 21st overall. The closest the team came to a stage victory was Davide Appollonio's second place on stage 12. Geraint Thomas secured Sky's first overall victory of the season, by winning the five-day Bayern-Rundfahrt race at the end of May. Boasson Hagen and Wiggins also won stages in the event, with Boasson Hagen claiming the points jersey. In June, Wiggins won the Critérium du Dauphiné, an important victory for Sky at the time. At the Tour de France Sky finished third on stage two, the team time trial. Boasson Hagen secured the team's first ever Tour stage win on stage six. On stage seven, just over 40 km (24.9 mi) from the finish, a crash brought down team leader Wiggins breaking his collarbone and ending his tour. This prompted a change of approach from Sky, with their riders targeting stage wins. On stage nine, Juan Antonio Flecha was hit by a French media car, which resulted in Flecha colliding with Vacansoleil–DCM rider Johnny Hoogerland, who crashed into a barbed-wire fence. Both riders were able to continue despite sustaining injuries in the incident. Geraint Thomas won the combativity award on stage 12. Boasson Hagen came second to compatriot Thor Hushovd (Garmin–Cervélo) on stage 16, before winning the next stage with a solo breakaway. He also finished second on the stage 21 on the Champs-Élysées. Rigoberto Urán was the highest placed Sky rider with 24th overall, whilst Boasson Hagen's efforts gave the team two stage wins in an eventful Tour. After the Tour de France, Boasson Hagen's good form continued, as he won the Vattenfall Cyclassics and took a clean sweep of jerseys at the Eneco Tour. In the third and final Grand Tour of the 2011 season, the Vuelta a España, Sky riders Froome and Wiggins finished second and third respectively in the general classification. Chris Sutton won stage two, while Froome won stage 17 of the event. On 11 October, it was announced that world champion Mark Cavendish would be joining the team for the 2012 season, bringing an end to months of speculation. He was joined by his HTC–Highroad teammate Bernhard Eisel. In January, Team Sky confirmed their squad for the 2012 season which included eight new signings, Cavendish, Eisel, Sergio Henao, Danny Pate, Richie Porte, Salvatore Puccio, Luke Rowe and Kanstantsin Sivtsov. At the Tour Down Under in January, Boasson Hagen won the sprint classification. In February Sky claimed the team classification at the Volta ao Algarve, with Porte winning the overall and Boasson Hagen the points classification. Wiggins won the overall classifications in the Paris–Nice in March and the Tour de Romandie in April. Sky dominated the Tour de France general classification with Wiggins first and Froome second overall, and Cavendish winning three stages including the sprint on the final stage on the Champs-Élysées in Paris. On 9 September, the team achieved their 100th victory with Lars Petter Nordhaug's win in the Grand Prix Cycliste de Montréal. The team also topped the UCI World Tour teams classification, with a total score of 1767 points. In preparation for the 2013 season, the signings of Vasil Kiryienka and David López García from Movistar Team and 2012 Italian national time trial champion, Dario Cataldo from Omega Pharma–Quick-Step were secured. The team have also signed Gabriel Rasch and on 1 October it was revealed that the team had also signed Joe Dombrowski and Ian Boswell, from the Bontrager-Livestrong team, as neo-pros. The year's Tour of Britain winner, Jonathan Tiernan-Locke had signed a two-year deal with the team. Riders leaving the team at the end of the 2012 season are, Cavendish who will move to Omega Pharma–Quick-Step, Lars Petter Nordhaug to Blanco Pro Cycling, Davide Appollonio to Ag2r–La Mondiale and Juan Antonio Flecha to Vacansoleil–DCM, Alex Dowsett to Movistar Team and Michael Rogers to Saxo Bank–Tinkoff Bank. Michael Barry and Jeremy Hunt will both retire. Doctor Geert Leinders, who had been employed by the Team since 2011, was subject of an internal investigation after allegations of involvement in doping at Blanco Pro Cycling earlier in his career, and on 9 October it was announced he would no longer work for the team. The impact of the USADA reasoned decision on doping by Lance Armstrong and teammates at the US Postal team led Sky to re-inforce its zero tolerance anti-doping policy, with all riders and staff being subjected to internal interviews. Two members of the coaching staff, Bobby Julich and Steven de Jongh were released from their contracts under the policy. Head Director Sportif Sean Yates also left the squad in October citing personal reasons, although the Telegraph linked his departure to past involvement in doping. The 2013 season began with the Tour Down Under, where Geraint Thomas won stage two and claimed the points classification. In February Froome won the overall classification, points classification and stage 5 Tour of Oman. In March Richie Porte won the Paris-Nice, including two of the last three stages in the race, the queen stage and the concluding time trial. Sergio Henao claimed his first victory for the team at the Volta ao Algarve, whilst Froome took a stage win at Tirreno–Adriatico. The team then picked up a one–two at the Critérium International with Froome securing victory with a win on the final stage and Porte finishing runner up with a victory in the stage two time trial, also securing the points competition. After his victory in the 2012 Tour de France Bradley Wiggins built his early season around targeting the 2013 Giro d'Italia and supporting Froome in the Tour de France. The team took victory in the stage 2 team time trial, culminating in Salvatore Puccio taking over the pink jersey as leader of the general classification. Wiggins was hampered behind a crash on stage 7  and then himself crashed on stage 8. Wiggins abandoned the Giro due to a chest infection on stage 13. Froome followed up with overall wins at the Tour de Romandie in April and Critérium du Dauphiné in June. Boasson Hagen retained his Tour of Norway title, winning the points classification and stage four of the race in the process. In July, Froome went on to win the 100th and 2013 edition of the Tour de France; claiming dominant stage victories on the stage eight final climb of Ax 3 Domaines, stage 15 to the summit of Mont Ventoux and the stage 17 individual time trial. Froome was narrowly beaten to the King of the Mountains prize by Movistar Teams Colombian climber and runner up, Nairo Quintana. After the Tour de France, some of the team's key domestiques secured stage victories at the Eneco Tour (David Lopez), and Vuelta a España (Vasil Kiryienka). After the disappointment of the Giro, Wiggins returned with a renewed focus on the 2013 UCI Road World Championships Individual time trial event. As part of his build up he won the seventh stage time trial at the 2013 Tour de Pologne from Fabian Cancellara by a winning margin of 56 seconds. The team then recorded their first ever victory in their home stage race, with Wiggins claiming the overall title in the Tour of Britain winning the stage three time trial in Knowsley Safari park. Wiggins finished his season with second in the World time trial championships, finishing 46 seconds behind triple world champion, Tony Martin, with the team taking the bronze in the team time trial. On 4 June 2013 it was announced that Australian Nathan Earle of the Continental team, Huon Salmon–Genesys Wealth Advisers, had been signed by the team for the 2014 season. On 1 August 2013, the first day of the cycling transfer window, it was confirmed that Rigoberto Uran would move to Omega Pharma–Quick-Step for the 2014 season. On 22 August it was announced that Mathew Hayman would leave the team at the completion of the season and join Orica–GreenEDGE on a 2-year deal. On 6 September it was announced that the Irishman Philip Deignan of UnitedHealthcare would be joining the team after a strong 2013 season. After heavy speculation at the road world championships it was announced on 1 October that Spanish climber, Mikel Nieve, would join the team on a two-year contract, following the closure of his current team (Euskaltel–Euskadi) at the end of the season. On 23 December Sebastián Henao (cousin of Team Sky rider Sergio Henao) was announced as the team's final signing for the 2014 season. The 2014 season started off well, Froome defended and retained his Tour of Oman crown and Kennaugh won his first stage race, the Settimana Internazionale di Coppi e Bartali. Throughout the season the team has endured repeated illnesses and injuries, Geraint Thomas pulled out of the Paris-Nice after crashing out on stage seven whilst leading the general classification. Richie Porte abandoned the Tirreno-Adriatico and the Volta Ciclista a Catalunya, resulting in Porte not competing in the Giro d'Italia. A further blow came when Kennaugh pulled out of the Giro, with the team citing illness. In April the team fortunes began to turn; Froome defended and won the Tour de Romandie, Wiggins won the overall classification of the Tour of California and Geraint Thomas won overall classification of the Bayern-Rundfahrt – each taking control of the race by winning the individual time trial stage respectively. Poor luck returned at the Critérium du Dauphiné, where Froome crashed whilst wearing the leaders jersey, despite taking three stage wins (two stages for Froome, one for Nieve) Froome finished outside of the top 10, 4' 25" down on race winner Andrew Talansky. In July, Froome returned to racing to defend his Tour de France victory, hopeful of overall victory Froome crashed twice on stage four and abandoned the race (having also crashed the day before) with Xabier Zandio abandoning on the sixth stage of the race. As a result, Richie Porte inherited team leadership duties but lost time in both the Alpine and Pyrenean stages. The team's highest rider on general classification was Nieve in 18th position, 46 minutes 31 seconds behind the winner, Vincenzo Nibali this marked one of the worst performances of the team at the Tour de France. Not selected to ride the Tour, Kennaugh went on to take his second overall race victory at the Tour of Austria, taking the points classification in the process. After abandoning the Tour de France, Froome announced he would ride the 2014 Vuelta a España where he finished in second position, finishing one minute ten seconds, behind the winner Alberto Contador. Froome was awarded the overall combativity award for the entire race. In September, Wiggins returned to the Tour of Britain with the stated aim of defending his title. He finished third overall, winning the final day time trial by eight seconds from Sylvain Chavanel. Wiggins returned to action later in September at the road world championships, again with the aim of winning the time trial event. Wiggins won the time trial by over 25 seconds from perennial opponent, Tony Martin. Wiggins won Team Sky's first ever rainbow jersey. On 28 July 2014, the team announced that Thomas had signed a two-year contract extension, keeping him at the team until the end of the 2016 season. In September Swift signed a two-year contract extension. On 13 August 2014, Cyclingnews.com reported that Edvald Boasson Hagen will not renew his contract and will leave the team at the end of the season. After the cycling World Championships, Sky announced that they had signed Leopold König, Nicolas Roche, Wout Poels, and Andrew Fenn, with Lars Petter Nordhaug rejoining the team after two years at Belkin. On 1 October 2014, it was announced that Dario Cataldo would leave the team at the end of the season to join Astana. On 24 October, the team announced the signing of their sixth rider, Elia Viviani. American climber Joe Dombrowski will also leave Team Sky to join Cannondale–Garmin. On 5 January 2015, Wiggins signed a contract extension with the team up until and including the 2015 Paris–Roubaix. On 8 January, Richie Porte scored the team's first victory of the season by winning the Australian National Time Trial championships and went on to record the team's first stage win at the Tour Down Under. Elia Viviani scored his first win for the team, taking sprint victory on stage two of the Dubai Tour. In February the team dominated the Vuelta an Andalucía and Volta ao Algarve with both Froome and Thomas taking both overall wins respectively. At the end of February Stannard scored the team second classic, taking a second successive victory at Omloop Het Nieuwsblad. The victory was made more impressive as Stannard made the four-man selection with three Etixx–Quick-Step riders; Boonen, Terpstra and Vandenbergh. The team's next victory came at Paris–Nice where Porte led a team one-two (along with Thomas) at the summit finish of Croix de Chaubouret. Porte won famous the stage 7 time trial to the summit of Col d'Èze. In the same week, Wout Poels recorded his first win for the team when he secured victory on the fifth stage of Tirreno–Adriatico to Castelraimondo. In late March, Thomas emerged victorious in E3 Harelbeke after attacking his co-breakaway companions, Zdeněk Štybar and Peter Sagan, and soloing to victory. Ben Swift then won the second stage of Settimana Internazionale Coppi e Bartali the same day and Richie Porte moved into the lead and eventually won the Volta a Catalunya Victory in Catalunya represented Porte's second overall win of the season and the fourth for the team. In April, Bradley Wiggins won his final time trial for the team at the Three Days of De Panne. Later in the same week, Bradley Wiggins retired from the team and joined his own WIGGINS team, allowing him to focus on the 2016 Olympic Games. In late April Porte won the Giro del Trentino taking a decisive stage victory on the queen stage summit finish to Brentonico. The team then rounded off a successful April by taking victory in the Team Time Trial at the Tour de Romandie, placing Geraint Thomas in the yellow leaders jersey whilst new signing Wout Poels underwent surgery on a broken shoulder bone courtesy of his crash at La Fleche Wallonne. The team began May with success; Lars Petter Nordhaug took the opening stage win at the inaugural Tour de Yorkshire, whilst Ben Swift crashed out later requiring surgery. The team entered the 2015 Giro d'Italia with Porte as team leader with the aim of winning the general classification. After limiting the time loss in the stage 1 team time trial Elia Viviani secured the first win for the team in a Grand Tour since the 2013 Vuelta a España on stage 2, also taking over the Maglia rossa. On stage 10 Porte lost 47 seconds, docked two minutes fine for accepting outside intervention, resulting in Porte dropping down to 12th on the general classification. Porte lost more time on the uphill finish on stage 12, a further two minutes on stage 13, and 27 minutes on stage 15. He then abandoned on the second rest day. Chris Froome returned to action at the Critérium du Dauphiné, as part of his build up for the Tour de France, and the team won three stages and took the overall title for the fourth time. Peter Kennaugh opened the team's account taking the victory on stage one, just in front of the bunch sprint finish. Froome went on to dominate the final two summit finish stages, taking victory at Montée du Bettex (stage 7) and Modane Valfréjus (stage 8) giving him a lead of 10 seconds over Tejay van Garderen. The team went into the 2015 Tour de France with their "strongest team ever" After a strong performance on the Mur de Huy Froome took over the race lead, and general classification by one second over Tony Martin. As the Tour entered the second week of racing stage 10 saw the first mountains stage, the summit finish of La Pierre-Saint-Martin, where Froome went on to take the stage win, putting significant time into his general classification rivals. During the remainder of the race the team faced intense scrutiny regarding their dominant performances; Porte was punched in the ribs by a spectator in the Pyrenees, and Froome had urine thrown at him by another spectator. On the first rest of the Tour de France Porte confirmed he would leave the team at the end of the season. This would later, in August, be confirmed to be CCC Team. The team signed Alex Peters and Tao Geoghegan Hart as stagiares for the remainder of the season, with the former also signing for two years. In September, Mikel Landa confirmed his move to the team for the 2016 season, with Mikel Nieve also signing a two-year extension with the team. Later, in the same month the team then signed their second neo-pro, Gianni Moscon, Michal Golas, Danny van Poppel, Beñat Intxausti and the 2014 World Road Race champion Michał Kwiatkowski. On 28 September the team confirmed that Nathan Earle, Bernhard Eisel, Danny Pate, Richie Porte, Kanstantsin Siutsou and Chris Sutton would be leaving the team. The team also confirmed that Ian Boswell, Philip Deignan, Sebastian Henao, Peter Kennaugh, Vasil Kiryienka, Christian Knees, Mikel Nieve, Luke Rowe, Ian Stannard and Xabier Zandio would be staying after signing new contract extensions. Later in September Sky retained the World Time Trial Championships in Richmond when Vasil Kiryienka won by nine seconds from Adriano Malori. Geraint Thomas pictured here at the 2016 Paris–Nice, where he would claim the team's fourth overall win in the past five seasons. With Chris Froome delaying the start of his season a number of key deluxe-domestiques were afforded opportunities to aim for race victories at the start of the season. Peter Kennaugh took the team's first one-day race win at the second Cadel Evans Great Ocean Road Race, whilst Wout Poels claimed his first overall GC victory at the Volta a la Comunitat Valenciana, in the process taking two stages, the mountains and the points classifications. Froome returned towards the end of the Australian cycling season to claim the team's first ever GC win at the Herald Sun Tour. Geraint Thomas enjoyed a successful start to his 2016 campaign, notching up overall victories at Volta ao Algarve (for the second successive year) and Paris–Nice. Thomas' victory in the French stage race means that Sky have won four of the past five editions. Sky entered the spring classics campaign with the perennial aim of claiming their first monument race. New recruit, Michał Kwiatkowski, took his first victory for the team in the E3 Harelbeke semi-classic. As the classics campaign progressed the team showed great consistency, but fell short of their goal again, taking second in Milan–San Remo, fifth at the Tour of Flanders and third at Paris–Roubaix. Upon entering the Ardennes classics the team pinned their hopes on Kwiatkowski at La Fleche Wallonne, to no avail. Entering the final monument of the spring, Liège–Bastogne–Liège, the team again led with Kwiatkowski. Sky finally achieved their coveted monument win, but it wasn't Kwiatkowski, but rather, domestique Wout Poels who emerged victorious on a day with poor weather conditions and enduring snow. New recruit Mikel Landa claimed his first overall win for team – taking the GC at the 2016 Giro del Trentino only a week after claiming his first stage win for the team. Landa's stated aim for the first half of the season is the Giro d'Italia. Froome added to Sky's race win total by successfully defending his Critérium du Dauphiné title after taking the overall lead with a victory on stage 5 to Vaujany, becoming the fifth rider to win the overall title three times. The team went into the 2016 Tour de France with what was without question an even stronger squad than the previous year. A week into the race on stage 8, Froome took many by surprise by attacking on the descent of the Col de Peyresourde which caught his main rivals off guard, resulting in a solo victory into Bagnères-de-Luchon to take the yellow jersey. On stage 11 to Montpellier in crosswinds, he gained more time as part of a 4-man breakaway in the final 12 kilometres of the stage alongside green jersey wearer Peter Sagan, Sagan's Tinkoff teammate Maciej Bodnar, and Froome's own teammate Geraint Thomas, placing second to Sagan in a sprint finish. On stage 12 to Mont Ventoux (which was shortened to Chalet Reynard due to high winds), Froome was involved in a crash involving a stopped motorbike that also sent Richie Porte and Bauke Mollema down. With no usable bike, Froome had no choice but to run partway up the mountain until he was able to get a spare bike from his team car. Provisionally he had fallen to sixth place overall which would have given the yellow jersey to Adam Yates, however race officials decided to give him and Porte the same time as Mollema, ensuring Froome would hold on to his first overall position. Superb performances in both the individual time trials (second on stage 13 to La Caverne du Pont-d'Arc and winner of stage 18 to Megève) allowed Froome to gain even more time on his rivals, and despite a crash on stage 19 to Saint-Gervais-les-Bains where he finished the stage on Thomas' bike with support from Wout Poels, it was enough for him to win the race overall 4:05 ahead of second-placed Romain Bardet, becoming the first British rider to win the Tour on three occasions, the fourth rider to become a 3-time winner (joining Philippe Thys, Louison Bobet and Greg LeMond), and the first since Miguel Indurain in 1995 to successfully defend his title. It was also the first time the team finished a Grand Tour with all nine riders intact. Sky started off their 2016 Vuelta a España campaign in late August by winning the team time trial on stage 1 and holding the red jersey for 2 days before surrendering it on stage 3, where Chris Froome took a 4th-place finish at Mirador de Ézaro to elevate himself into third place in the overall standings. He then got the victory on stage 11 at Peña Cabarga, the very same mountain where he got his first-ever Grand Tour stage win in 2011, and put himself into second overall just under a minute behind race leader Nairo Quintana. A series of early attacks by Quntana and Alberto Contador on stage 15 to Aramon Formigal blew the race apart, causing Froome to be isolated from his teammates and to lose more than 2 and a half minutes on his rival. He gained most of that time back on the stage 19 time trial to Calp with a dominant performance, but was unable to make up the difference in the penultimate stage, finishing second overall in the end by just 1:23 behind Quintana. It was Froome's second Grand Tour podium following his win at the Tour de France, and just coming off of winning the bronze medal in the time trial at the Olympic Games in Rio. In August 2016 the news broke that the team had signed Olympic Team Pursuit champion, Owain Doull from WIGGINS and Tao Geoghegan Hart from Axeon–Hagens Berman Later, in the same month, the team confirmed their third signing of the season – Polish rider Łukasz Wiśniowski from Etixx–Quick-Step. For the 2017 season Nicolas Roche will leave for BMC Racing Team, as well as Andy Fenn, Lars Petter Nordhaug (both to new Irish team Aqua Blue Sport) and Leopold König (to Bora–Hansgrohe). Luke Rowe, Chris Froome, Christian Knees, Salvatore Puccio and Geraint Thomas have renewed with the team. In September the team announced the signing of Kenny Elissonde from Groupama–FDJ on a two-year deal. On 30 September, Wout Poels signed a three-year contract extension with the team. Elia Viviani signed a new 2-year deal on 26 October. The team announced on 27 October that it had signed Diego Rosa from Astana on a 3-year deal, and on 8 November announced the signing of Doull's WIGGINS teammate Jonathan Dibben. The team finished the 2016 season 3rd overall in the UCI World Tour team rankings, with Froome as its highest-ranked rider, finishing 3rd overall in the individual rider ranking. Sky started the 2017 season with three stage wins at the Herald Sun Tour as well as winning the teams classification, with new team member Kenny Elissonde finishing on the podium in 3rd place and Chris Froome finishing sixth overall. The team's first race win of the season came at Strade Bianche when Michał Kwiatkowski took a solo victory after attacking 15 kilometers from the finish. Geraint Thomas took a stage win at Tirreno-Adriatico and held the leader's jersey for one day, also taking the overall victory and one stage win at the Tour of the Alps. Sky won Paris-Nice for the fifth time in sixth years courtesy of Sergio Henao, who won the race overall by just two seconds over Alberto Contador. Kwiatkowski added to Sky's win total by winning Milan-San Remo in a three-up sprint, giving the team its second Monument win. Neo-pro Jonathan Dibben won the individual time trial stage at the Tour of California, the team also winning the team classification with Tao Geoghegan Hart and Ian Boswell placing in the final top ten overall. Thomas and Mikel Landa were appointed the team's joint leaders for the Giro d'Italia. At one point in the race, Thomas was sitting second in the general classification, however on the 9th stage to Blockhaus a fair chunk of the peloton was involved in a crash involving a stopped motorbike, which took down Thomas, Landa and most of the other members of the team. Thomas attempted a comeback after placing second in the following day's time trial, but the extent of his injuries were as such that he abandoned the race prior to stage 11. Landa continued as sole leader, taking several top-3 finishes on several mountain stages before finally winning stage 19 to Piancavallo. He went on to win the mountains classification and the super-combativity prize, also winning the Cima Coppi for being the first to cross the summit of the Stelvio Pass on stage 16. The team then participated in the inaugural Hammer Series, a three-day event pitting teams against each other in various skills competitions. Impressive performances by Tao Geoghegan Hart in the climbing event and Elia Viviani in the sprint event gave the team enough points to take the overall lead. In the team time trial-style Chase event, they held on by one second over Team Sunweb to win the entire competition. Froome returned to action at the Critérium du Dauphiné and finished fourth overall, just one second off the podium. Teammate Peter Kennaugh won the penultimate stage at Alpe d'Huez. The team then went into the Tour de France with yet another strong lineup and the goal to help Froome achieve his fourth overall victory. In the opening prologue stage in Düsseldorf the team placed four riders within the top eight led by Geraint Thomas, who became the first Welsh rider to wear the yellow jersey. He was followed by Vasil Kiryienka in third, Froome in 6th and Kwiatkowski in eighth - Froome putting between 35 seconds and nearly a minute into most of his general classification rivals. On stage five to La Planche des Belles Filles, Froome took third place behind stage winner Fabio Aru, moving him into yellow and Thomas to second place. The 1-2 placing on GC held until stage nine to Chambéry, when Thomas was involved in a crash on the descent of the Col de la Biche and had to abandon the race with a fractured collarbone. On stage 12 to Peyragudes, Froome cracked within the final kilometer, ceding 22 seconds and the yellow jersey to Aru. On the final approach on stage 14 to Rodez the team stretched out the peloton, splitting it into several groups due to crosswinds allowing Froome to put 25 seconds into Aru, enough to retake yellow by a margin of 18 seconds overall. On stage 15 to Le Puy-en-Velay, Froome ran into mechanical trouble on the ascent of the Col de Peyra Taillade and was distanced by more than 40 seconds thanks to a brutal acceleration by the AG2R La Mondiale team, but with the help of his teammates he managed to make it back to the main group of GC contenders to keep his overall lead intact. Froome and Landa performed strongly in the Alpine stages to Serre Chevalier and Izoard helping Landa move into fourth overall. In the final time trial in Marseille, Froome's strength in the discipline helped him put nearly two minutes into Romain Bardet and 25 seconds into Rigoberto Urán, finishing third on the stage six seconds behind stage winner Maciej Bodnar and 5 seconds behind second-place Kwiatkowski. Froome secured his fourth Tour victory and third consecutively, putting him one win away from joining the likes of Anquétil, Indurain, Merckx and Hinault. He also became the 7th man to win the Tour overall without winning a stage, however he did amass ten top-ten finishes. Sky also won the team classification for the first time in their history, leading from start to finish. A week after the end of the Tour de France, Kwiatkowski continued his strong rides in the one-day classics by winning the Clásica de San Sebastián, and on 8 August signed a three-year contract extension. After months of recovery following his injury, Wout Poels returned to form by winning the final stage of the Tour de Pologne and finishing third overall, with teammate Diego Rosa taking the mountains classification. Landa followed up his performance in the Tour with overall victory in the Vuelta a Burgos, also winning two stages, the mountains classification and the points classification. The team sent its strongest-ever squad to the Vuelta a España, with Froome on a mission to finally win the race that had eluded him on multiple occasions. After a 4th-place finish in the opening team time trial in Nîmes, Froome took third place on the third stage at Andorra behind Vincenzo Nibali. Combined with bonus seconds picked up from the stage's intermediate sprint, it was enough to move him into the overall race lead, collecting his first red jersey since stage 10 in 2011. Several days later, he took his first stage win of his season at Cumbre del Sol, which also moved him into the lead in the points classification, followed by a second-place finish at Calar Alto on stage 11. The following day to Antequera, Froome crashed twice after a mechanical, but managed to limit his time losses with the help of his teammates and bounced back on the next 3 stages with consecutive top-10 finishes and regained the points lead after stage 15. Froome then dominated the stage 16 individual time trial to Logroño, extending his lead to nearly 2 minutes ahead of Nibali. However, he struggled on the steep slopes to Los Machucos the next day, dropping about 40 seconds to Nibali. He regained half that loss on stage 18, and cemented the overall lead as well as the combination classification with a third-place finish at Alto de l'Angliru behind Alberto Contador on stage 20. In a bunch sprint finish on the final stage in Madrid, he held on to the points classification by two points over Matteo Trentin. With the victory, Froome became the first British rider to win the Vuelta, the third man to complete the Tour-Vuelta double in the same year (joining Jacques Anquetil and Bernard Hinault), and the first to complete the feat in the modern era since the Vuelta moved to its current August–September time period. A week after the Vuelta victory, the team won the bronze medal in the team time trial at the 2017 UCI Road World Championships in Bergen. On 30 June, the eve of the Tour de France Grand Départ, Froome signed a 2-year contract extension with the team. The team announced the signings of Jonathan Castroviejo (Movistar Team) and David de la Cruz (Quick-Step Floors) for the 2018 season. On 27 August 2017, the team also announced the signing of 2017 Tour de l'Avenir winner Egan Bernal (Androni–Sidermec–Bottecchia). A day later, they announced the signings of reigning Under 23 Road Race World Champion Kristoffer Halvorsen (Joker Icopal) and 2017 Girobio overall winner Pavel Sivakov (BMC Development Team), Then on 1 September, it was revealed that 2017 British Under-23 road race champion Chris Lawless had also been signed from Axeon–Hagens Berman. Dylan van Baarle (Cannondale–Drapac) was signed on 18 September 2017. On 5 December 2017, the team announced that they had signed Leonardo Basso, a stagaire with Trek–Segafredo. Whilst Mikel Landa transferred to Movistar, Mikel Nieve to Mitchelton–Scott, Peter Kennaugh to Bora–Hansgrohe and Ian Boswell to Team Katusha–Alpecin. Elia Viviani ended his contract a year early to join QuickStep for the 2018 and 2019 seasons. Christian Knees, Michal Golas, Sebastian Henao, Phil Deignan, David Lopez and Ian Stannard all signed multi-year contract extensions. The team finished the 2017 season on top of the UCI World Tour team ranking for the first time since 2012. Chris Froome was the highest-ranked rider in the individual rankings, placing second. The team's first victory of the year came via highly regarded new recruit, Egan Bernal claiming victory in the Colombian national time trial championships. Team mate Sergio Henao would also claim victory in the national road race championships leading to a clean sweep of national titles. Bernal continued his strong early season form, claiming overall victory at the Colombia Oro y Paz. As the European stage racing season kicked-off Wout Poels and David de la Cruz claimed victories at Vuelta a Andalucía. Michal Kwiatkowski and Geraint Thomas claimed a one–two victory at Volta ao Algarve. Poels and de la Cruz continued their strong form, claiming stage victories at Paris–Nice, whilst Kwiatkowski claimed a second overall general classification victory, winning Tirreno–Adriatico – the teams first victory at the race. In the lead up to the first Grand Tour of the year, the 2018 Giro d'Italia, Diego Rosa emerged victorious at Settimana Internazionale Coppi e Bartali, claiming his first overall win for the team. New recruits; Chris Lawless and Pavel Sivakov also claimed their first classification victories for the team, with Lawless also winning a stage of the race. Bernal had been en route to claim second place at his first World Tour event of the year, Volta a Catalunya, however a late crash on the final stage of the race saw Bernal abandon. Bernal would next race at the Tour de Romandie where he would win the stage three time trial and with it, the young rider classification. Moving on to the 2018 Tour of California, Bernal would lead the team's general classification ambitions, resulting in his first World Tour stage race victory, claiming two stages as well. Chris Froome would enter the Giro d'Italia as favourite to win the overall race. 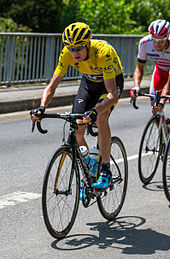 As the current champion of both the Tour de France and Vuelta a España, Froome had the opportunity to join an elite group of riders who concurrently held all Grand Tour titles. The Giro started in Israel for the first time and before the race had begun Froome had already crashed during a recon of the first stage time trial route. Froome would cede over 30 seconds to main race rival, Tom Dumoulin as well as 20 seconds to Simon Yates. As the race returned to Italian land, Froome found himself over 50 seconds down on the maglia rosa - Rohan Dennis. By the end of stage six, the races first summit finish at the top of Mount Etna Froome had moved up to eighth position overall, but had lost over a minute to new race leader, Yates. By the end of the eighth stage and third mountain-top finish at Gran Sasso d'Italia, Froome trailed Yates by nearly two and a half minutes, with general classification hopes looking all but impossible. Froome's domestiques, Poels and Sergio Henao, were 18th and 25th overall 3' 14" and 5' 56" behind the race leader. By the end of stage 13, Froome had slipped back to 12th overall 3' 20" behind race leader, Yates. Stage 14 would see the riders face the fearsome climb of Monte Zoncolan, with gradients reaching nearly 20%. Froome attacked the main selection of favourites, winning the stage from Yates. Unfortunately however, Froome's improved form would not be maintained into stage 15, with Yates claiming the victory on the medium-mountain stage by a margin of 41 seconds over everyone race. Yates' lead in the race would now grow to 2' 11" over Dumoulin and 4' 52" over Froome - who was now sat in seventh place overall. The time trial on stage 16, from Trento to Rovereto, had been a focus-point for Froome, hoping to claw back significant amounts of time over Yates' by virtue of his stronger time-trialling ability. Froome would cut the deficit to 3' 50" by the end of the stage, having taken back over a minute from Yates. Deep into the third week of the race, stage 18 would see the first sign of weakness from Yates, cracking on the final climb of the day to Prato Nevoso, with the deficit to Dumoulin in second cut to 28 seconds and 3' 22" to Frooome. Stage 19 of the 2018-edition of the race had been designated as the races' queen stage, starting in Venaria Reale, the stage would climb over a trio of mountains; the part-gravel Colle delle Finestre, climb to Sestriere ending at Bardonecchia. Yates' poor form continued into stage 19, culminating in him being dropped by the peloton on the lower slopes of the Finestre, promoting Domoulin to virtual race leader. With over 80 kilometres remaining in the stage Froome attacked the peloton on the gravel section of the Finestre, pulling away from the main group of favourites. This attack would continue over the subsequent two climbs with Froome ultimately winning the stage by three minutes from second place Richard Carapaz, but importantly by over 3' 20" from Dumoulin. Froome was now leading the race overall by 40 seconds from Dumoulin with two stages remaining. Froome would maintain his race lead, becoming the fifth rider to simultaneously hold all three grand tour titles. Froome also won the mountains classification largely due to his stage 19 exploits, and Team Sky won the overall team classification. As the cycling season entered the European summer, the build to the 2018 Tour de France had begun. Geraint Thomas claimed overall victory at the Critérium du Dauphiné improving his chances of being promoted to team-leader for the Tour de France. The team would go on to score a number of national title victories: Jonathan Castroviejo won the Spanish time trial title, Kwiatkowski the Polish road race, Dylan van Baarle the Dutch time trial, Thomas the British time trial and Vasil Kiryienka the Belarusian time trial. As the Tour de France began, the team lead with a two-pronged attack, incumbent champion Froome hoping for a fourth straight grand tour win and fifth overall title and Thomas reigning Dauphiné champion and super-domestique in previous editions of the race. By the end of the first week of racing Thomas had rode a flawless race and was second overall, only six seconds behind Greg Van Avermaet. Froome on the other hand was 14th, over a minute behind the Belgian race leader. Thomas and Froome both lost time to Van Avermaet on stage nine as the race transitioned across the cobbles of Roubaix, with Thomas 43 seconds and Froome 1' 42" behind the race leader. By the end of stage 10 these deficits had grown to 2' 22 for Thomas and 3' 21" for Froome. As the race entered the Alps Thomas would cement his control on the race and the team, claiming consecutive victories at the summit finishes of La Rosière and Alpe d'Huez. By the end of stage 12 Thomas lead had grown to 1' 39" over team-mate Froome. Colombian prodigy, Bernal, in his first grand tour of his career was 19th overall 21' 22" behind Thomas. Following the 15th stage, controversy arouse around Gianni Moscon, who had been seen punching Fortuneo–Samsic rider Élie Gesbert during the opening kilometres of the stage. After reviewing footage of the incident, the race jury disqualified him for 'particularly serious aggression', leaving Sky with 7 riders for the remaining stages. On stage 17 Froome cracked, slipping to third overall 2' 31" behind Thomas. This promoted Giro d'Italia runner-up, Tom Dumoulin, to second overall 1' 59" behind Welshman Thomas. Thomas would ultimately win the race overall, and the team would record their fourth consecutive grand tour win, fifth Tour de France title and second successive year achieving more than one grand tour win. Thanks to his second-place performance on the penultimate day time trial, Froome joined Thomas on the final podium finishing third overall. Into the latter part of the season, Kwiatkowski would maintain his good form from the Tour de France, winning his home stage race – the Tour de Pologne, claiming two stage wins. He would head into the final grand tour of the year, the Vuelta a España, as the team's general classification leader but would finish 43rd overall, nearly an hour and three quarters behind race winner, Simon Yates. The teams best finisher was de la Cruz, 15th overall and 28 minutes behind the race winner. The team would go onto claim two stage wins at the Tour of Britain courtesy of Poels and Ian Stannard. Gianni Moscon returned after a five-week suspension in good form as the road to the final monument of the year began, winning Coppa Agostoni and the Giro della Toscana, as well as the Italian national time trial title. Moscon would go onto take overall victory at the 2018 Tour of Guangxi – the team's final victory of the year. In mid-December 2018, Sky announced they would withdraw their sponsorship as part of an ongoing review brought on by their acquisition by Comcast. 21st Century Fox also announced that it would end its partnership at the end of the season, forcing the team into a sponsorship search in order to continue. In February 2019, Cyclingnews.com reported that potential sponsorship could be sourced via a combination of the Colombian government and state-controlled oil and gas company, Ecopetrol. Later reports claimed that no deal had been forthcoming. In mid-March, Cyclingnews.com again broke news that another potential sponsor had been found. The report linked the team with British-based multi-national chemical company, Ineos, with the team expected to become Team Ineos for the 2020 season. Ineos is controlled by Manchester-born billionaire, Jim Ratcliffe, who has amassed an estimated fortune of over £21 billion. Ratcliffe has also invested over £100 million in Ben Ainslie's sailing team. The web-domain "TeamIneos.com" was discovered to have been registered on 5 March, and the Twitter handle "@teamineos" was also registered. On 19 March, Team Sky confirmed its new title sponsor, announcing it was to be renamed 'Team INEOS' on 1 May, ahead of the 2019 Tour de Yorkshire. However, the UCI's rules prevent teams from racing under different names at the same time - Sky had planned to take part in the 2019 Tour de Romandie, starting on 30 April as well as the Tour de Yorkshire. As a consequence, it announced that the Romandie would be the first race under the INEOS name, with the team wearing a special black kit, while the Yorkshire would see the launch of the team's new colours. For the 2019 season the team signed world individual pursuit champion, Filippo Ganna and former rider, Ben Swift (UAE Team Emirates); former Ecuadorian national road champion, Jhonatan Narváez (Quick-Step Floors).After a protracted transfer the team also signed Colombian talent – Ivan Sosa (Androni Giocattoli–Sidermec). Philip Deignan and David López retired, Sergio Henao left to join (UAE Team Emirates), Beñat Intxausti joined Euskadi–Murias and Łukasz Wiśniowski joined the newly Polish-sponsored BMC team, CCC Pro Team. Jonathan Dibben also left the team. According to the results of a study commissioned by Cyclingnews.com and performed by Repucom, the team gave more media value to their sponsors and partners than any other cycling team. The team delivered approximately $550m in advertising value, the highest amount achieved by any professional team. BSkyB provided £30 million in sponsorship for the team and will back the team as name sponsor until the end of 2013. The team also receives further sponsorship from 21st Century Fox (previously News Corporation) and Sky Italia. Pinarello supplies bicycle frames and forks. On 5 January 2010, Adidas were announced as the team's official apparel and accessories partner. Gatorade, Marks & Spencer, Oakley, IG Markets are additional sponsors and Jaguar are providers of the team cars. The team jerseys were changed to black and green beginning with the 2011 Tour de France, when the team formed Sky Rainforest Rescue, a three-year partnership with WWF to help raise awareness of deforestation in Brazil. At the 2018 Tour de France, the team wore special kit in support of the Sky Ocean Rescue initiative, with the goal of eliminating single-use plastic team-wide by 2020. On 25 June 2013, the team announced that the logo of 21st Century Fox (the direct successor to News Corporation following the spin-off of its publishing business) would appear on the team's kit and team vehicles. The team support car at the 2012 Tour de France, with a change of livery due to rider Bradley Wiggins wearing the yellow jersey. On the second rest day of the 2016 Tour de France, the team announced they had signed a four-year extension with Pinarello – supplying the team with bikes until 2020. Castelli started providing the team's kit beginning in 2017 after their 3-year partnership with Rapha ended. The new kit was revealed during the Rouleur Classic event on 3 November 2016. On 12 December 2018, Sky's parent company 21st Century Fox confirmed that they would withdraw sponsorship of the team at the end of the 2019 season, but would until the 2019 Tour de France seek a new sponsor. On 19 March 2019, Team Sky announced that INEOS, a multinational chemicals company owned by Jim Ratcliffe, would become the new title sponsor as of 1 May 2019. A five-part documentary series following the team's 2012 season, Team Sky and British Cycling: The Road to Glory, premiered on Sky Atlantic on 30 August 2012. Another documentary Bradley Wiggins: A Year in Yellow, following Wiggins' exploits in the 2012 season was first shown on the same channel in November 2012. The team have also produced two books chronicling the 2012 Tour de France and 2013 season- 21 Days to Glory and The Pain and the Glory. The team has a zero-tolerance approach to doping. All its riders and staff must sign an agreement that they have no past or present involvement in taking illegal substances. Anyone breaching the agreement at any time must leave the squad. Previous team members such as team doctor Geert Leinders, sports director Steven de Jongh and coach Bobby Julich have all left the team when their involvement in doping prior to working with Sky became known. This approach has been criticised by David Howman of WADA, who has argued that fear of losing their job will discourage people with a history of doping from confessing. Although there have been speculations that Team Sky's tactics and success imply use of banned substances, Brailsford has strenuously denied any team use of illegal substances, citing his team's success in the Olympics as proof that you don't need to dope to dominate. In September 2013, Jonathan Tiernan-Locke was asked by the UCI to explain a potential discrepancy in his biological passport data. In December 2013, British Cycling confirmed it had been instructed to begin disciplinary proceedings against Tiernan-Locke by the UCI. Sky stated the blood values in question were taken in 2012, when Tiernan-Locke was a member of the Endura Racing squad, and he was suspended from all team activities pending a decision. In July 2014 Tiernan-Locke was banned from competition until 31 December 2015 by the UCI, resulting in his contract with the team being terminated with immediate effect. In March 2014, Sergio Henao was removed from race schedules for at least eight weeks pending the conclusion of an "altitude research programme", following tests that were taken over the winter whilst Henao was training at altitude in Colombia. In June 2014, Henao returned to racing at the Tour de Suisse, after completing an independent research programme investigating the physiology of "altitude natives" in conjunction with the University of Sheffield. In April 2016, the Cycling Anti-Doping Foundation (CADF) opened an investigation into Sergio Henao's biological passport data from between 2011 and 2015. As a result, the team withdrew Henao from their active roster. After investigation, including a review of the research done in the previous year for Team Sky, CADF declared Henao had no case to answer, and he was restored to the racing squad. In December 2017 Chris Froome returned an adverse analytical finding (AAF) for salbutamol over the WADA threshold of 1000 ng/mL, potentially resulting in a ban and the loss of his 2017 Vuelta title. On 2 July 2018, the UCI with the assistance of WADA concluded there was no AAF upon further investigation of the evidence and closed the case against Froome, exonerating him from any wrongdoing which allowed his Vuelta title to stand. Both Froome and the team welcomed the decision. In September 2016, Russian cyber espionage group Fancy Bear hacked the World Anti-Doping Agency (WADA) ADAMS anti-doping system and released data on a number of athletes, including Chris Froome and Bradley Wiggins. Therapeutic use exemptions (TUEs) are medical exemptions athletes can be given when they need treatment for pre-existing medical conditions where the drugs used in the treatment are on the WADA prohibited compound list. The leak demonstrated that Wiggins had received TUEs for triamcinolone acetonide in June 2011, June 2012 and April 2013, a number of days before the start of the 2011 Tour de France, 2012 Tour de France, and 2013 Giro d'Italia respectively. Wiggins also received TUEs for salbutamol, fluticasone, formoterol and budesonide whilst at Team Highroad. Froome had received TUEs for prednisolone in May 2013 and during the 2014 Tour de Romandie. In response Froome said he had "no issues" with the leak whilst Wiggins' spokesperson said "there's nothing new here". In October 2016, UK Anti-Doping (UKAD) opened an investigation into Team Sky and British Cycling. It was revealed that Simon Cope delivered a package, to the team, during the 2011 Critérium du Dauphiné, giving it to team Doctor – Richard Freeman – confirming the package contained some form of medicine. Neither the team nor Cope could confirm the exact contents of the package. Former rider, Jonathan Tiernan-Locke (who has since served a ban for an anti-doping violation) claimed that Freeman had administered Tramadol to the British national team during the 2012 UCI Road World Championships. In late October, parliament announced it would open an investigation into the relationship between the medical package and former rider, Bradley Wiggins. In December 2016, UCI President Brian Cookson urged both Team Sky and general manager, Dave Brailsford to give "full disclosure" about what was in the package. British Cycling has warned Cope about his relationship with both the team as well as the British National team. In December 2016, Brailsford announced that the package contained the legal drug, Fluimucil – a mucolytic compound which helps the body to remove sticky and thick mucus that can often be found obstructing the airway, resulting in coughing. British Cycling officials maintained that they did not know the contents of the package, whilst the Daily Mail broke the news that Brailsford had attempted to have the package-story killed in the media. In March 2017, British Cycling admitted its failure in correctly recording the contents of the package, whilst the team maintained that no anti-doping rules had been broken. In early March news broke around a number of riders potentially considering asking Brailsford to resign from the team, however in the same day Geraint Thomas, Luke Rowe, Tao Geoghegan Hart, Peter Kennaugh, Michal Kwiatkowski and Elia Viviani came out in support of their General Manager. In March, former team rider, Joshua Edmondson admitted to the BBC that he violated the teams "no needle" policy by injecting himself with a cocktail of vitamins – carnitine, folic acid, 'TAD' (reduced glutathione – two or three times a week, for a month. The team stated that they found the vitamins, which are not prohibited compounds, and needles in the riders room. A day later the UCI's Cycling Anti-Doping Foundation has asked UK Anti-Doping to assess Edmondson's admission. On 15 November 2017, the UKAD announced that it has closed its investigation and filed no charges, citing that it was impossible to determine the contents of the package. Both the team and British Cycling issued statements welcoming its conclusion. In March 2018, The Commons Digital, Culture, Media and Sport Committee published the report Combatting doping in sport. The report stated that Team Sky had "crossed an ethical line" by using medical drugs to "enhance the performance of riders" and that Brailsford must "take responsibility for the "damaging scepticism about the legitimacy of his team’s performance and accomplishments." Following the report Bradley Wiggins, in an interview with the BBC, claimed that he "100 per cent did not cheat", and believed he was a victim of a smear campaign. He was also critical of the 'anonymous' source, demanding that the source should be made public. Chris Froome later came out in support of Brailsford remaining team principal, rubbishing the accusations laid out in the report whilst Geraint Thomas said that the team had never even joked about using corticosteroids. Former rider, Bernhard Eisel being interviewed at the 2018 Tirreno–Adriatico, also denied any drug use during his tenure with the team. Eisel also criticised reports for a lack of verifiable proof, further suggesting that this had "...created a vacuum, within which he [Eisel] felt social media had filled in the blanks" as well as criticising comments made by former cyclist, Floyd Landis, regarding the removal of Wiggins' 2012 title. As of 5 January 2019. ^ a b "Team Sky hands Knaven and Portal directeur sportif roles". cyclingnews.com. 2 February 2015. Retrieved 4 March 2015. ^ "Gabriel Rasch to retire in 2014 and become Team Sky Sports Director". skysports.com. 31 October 2013. Retrieved 4 March 2015. ^ "Brett Lancaster retires from racing, joins Sky as sport director". VeloNews.com. ^ a b c William Fotheringham (26 February 2009). "Sky to sponsor British Tour de France team". London: The Guardian. ^ "Team Sky: A meteoric rise to success in just two years". The Independent. 22 July 2012. Retrieved 4 February 2013. Team Sky launched in 2010 with the ambition of winning the Tour de France with a British rider within five years. Bradley Wiggins has achieved it in three. ^ a b "Team Ineos set to race for first time earlier than planned". BBC Sport. 19 April 2019. Retrieved 19 April 2019. ^ Sabbagh, Dan (23 July 2012). "James Murdoch was key force behind Sky team's Tour de France victory". The Guardian. Retrieved 25 July 2012. ^ a b c Ned, Boulting (2011). How I won the yellow jumper : dispatches from the Tour de France. London: Yellow Jersey Press Random House. ISBN 9780224092401. OCLC 872702451. ^ Gallagher, Brendan (26 February 2009). "Sky establish GB Tour de France team". The Telegraph. Retrieved 25 July 2012. ^ "Team Sky on target". Sky Sports. 25 August 2009. ^ "Sky to nurture young talent". Cyclingnews. 31 December 2009. ^ Alex Murray (9 September 2009). "Team Sky names the Brit pack". ^ "More stars for Team Sky". Sky Sports. 10 September 2009. ^ Les Clarke (23 October 2009). "Sutton's Sky switch makes good sense". Cyclingnews.com. ^ Jonathan Turner (10 December 2009). "Wiggins signs for Team Sky". Sky Sports. ^ Shane Stokes (4 January 2010). "Swift set to move to Team Sky". Cyclingnews.com. ^ "Announcing Team Sky – A Professional British Road Cycling Team". BSkyB. 26 February 2009. ^ "Tour de France wildcard place awarded to Team Sky". Cycling Weekly. 30 March 2010. ^ "Pro Cycling | Team | Geraint Thomas". Team Sky. 25 May 1986. Archived from the original on 2 January 2012. Retrieved 1 January 2012. ^ "Pro Cycling | Vuelta a Espana | Stage 7 | Sky withdraws from Vuelta". Team Sky. 4 September 2010. Retrieved 1 January 2012. ^ "Cycling Quotient". Cqranking.com. Retrieved 1 January 2012. ^ "Pro Cycling | Tour Down Under | Latest News | Perfect finish in Adelaide". Team Sky. Retrieved 1 January 2012. ^ "Pro Cycling | Tour of Oman | Latest News | Boasson Hagen seals second". Team Sky. Retrieved 1 January 2012. ^ "Pro Cycling | Paris – Nice | Latest News | Wiggins bags third in France". Team Sky. Retrieved 1 January 2012. ^ "Dwars door Vlaanderen | So close for Thomas". Team Sky. Retrieved 1 January 2012. ^ "Pro Cycling | Tour of California | Latest News | Swift strikes gold in USA". Team Sky. Retrieved 1 January 2012. ^ "Tour of California | Team Sky's US invasion". Team Sky. Retrieved 1 January 2012. ^ "Giro d'Italia | Plenty to take out of Giro". Team Sky. 2 June 2011. Retrieved 1 January 2012. ^ "Pro Cycling | Bayern-Rundfahrt | Latest News | Thomas the boss in Bavaria". Team Sky. Retrieved 1 January 2012. ^ Purnell, Gareth (13 June 2011). "Cycling: Wiggins seals Dauphiné triumph". The Independent. Retrieved 20 July 2012. ^ "Tour de France – Cavendish wins, Wiggins out – Yahoo! Eurosport". Uk.eurosport.yahoo.com. Retrieved 1 January 2012. ^ "Video: TV Car Crashes Flecha, Hoogerland | This Just In". Bicycling.com. 10 July 2011. Archived from the original on 28 September 2012. Retrieved 1 January 2012. ^ "Tour bosses eject car after crash". BBC News. 10 July 2011. ^ Wynn, Nigel (19 July 2011). "Thomas signs to Sky for further three years". Cycling Weekly. IPC Media Limited. Retrieved 25 July 2012. ^ "Chris Froome and Bradley Wiggins make Vuelta history". BBC Sport. 11 September 2011. Retrieved 22 September 2011. ^ "Chris Froome wins Vuelta a Espana 17th stage". BBC Sport. 7 September 2011. Retrieved 22 September 2011. ^ "Mark Cavendish announces Team Sky move". BBC Sport. 11 October 2011. Retrieved 11 October 2011. ^ "Team Sky sign Eisel". Sky Sports. 11 October 2011. Retrieved 11 October 2011. ^ "Mark Cavendish's Team Sky confirm line-up for 2012 season". BBC Sport. 4 January 2012. Retrieved 4 January 2012. ^ Brown, Gregor (22 January 2012). "Gerrans wins Tour Down Under overall, Greipel takes final stage". Cycling Weekly. Adelaide: IPC Media Limited. Retrieved 18 October 2012. ^ "Wiggins: Algarve a "brilliant week" for Team Sky". Cyclingnews.com. Future Publishing Limited. 21 February 2012. Retrieved 18 October 2012. ^ "Wiggins not so easy on Eze". Paris–Nice. Amaury Sport Organisation. 11 March 2012. Archived from the original on 10 March 2012. Retrieved 11 March 2012. ^ "Bradley Wiggins wins Tour de Romandie for Team Sky". BBC Sport. BBC. 29 April 2012. Retrieved 30 April 2012. ^ "Bradley Wiggins wins 2012 Tour de France". BBC Sport. BBC. 22 July 2012. Retrieved 18 October 2012. ^ "Cavendish on top in Paris". Team Sky. 22 July 2012. Retrieved 22 July 2012. ^ "Team Sky wrap up WorldTour victory". Team Sky. 15 October 2012. Retrieved 18 October 2012. ^ "Sky sign new American riders". 1 October 2012. Retrieved 1 October 2012. ^ "Sky sign JTL". 4 October 2012. Retrieved 4 October 2012. ^ "Cavendish moves to OPQ". 18 October 2012. Retrieved 18 October 2012. ^ "Nordhaug moves to Rabobank". 18 October 2012. Retrieved 18 October 2012. ^ "Flecha moves to VCD". 20 August 2012. Retrieved 18 October 2012. ^ "Dowsett to MOV". 30 October 2012. Retrieved 5 November 2012. ^ "Rogers to Saxo-Tinkoff". 7 December 2012. Retrieved 13 December 2012. ^ "Barry retires". 6 September 2012. Retrieved 18 October 2012. ^ "Hunt retires". 9 September 2012. Retrieved 18 October 2012. ^ MacMichael, Simon (9 October 2012). "Team Sky confirms it will no longer work with Dutch doctor Geert Leinders". road.cc. Farrelly Atkinson Limited. Retrieved 9 March 2013. ^ "Yates & De Jongh released from sky". Cyclingnews.com. Retrieved 28 October 2012. ^ Gallagher, Brendan (29 October 2012). "Sean Yates leaves post at Team Sky and retires from cycling for health reasons". The Telegraph. Telegraph Media Group Limited. Retrieved 9 March 2013. ^ Gallagher, Brendan (28 October 2012). "Sean Yates parts company with Team Sky as Dave Brailsford's doping cull continues". The Telegraph. Telegraph Media Group. Retrieved 9 March 2013. ^ "Geraint Thomas wins stage to take lead in Tour Down Under". BBC Sport. BBC. 23 January 2013. Retrieved 23 January 2013. ^ Wynn, Nigel (16 February 2013). "Chris Froome wins the Tour of Oman". Cyclin Weekly. IPC Media Limited. Retrieved 16 February 2013. ^ Pryde, Kenny (10 March 2013). "Richie Porte wins Paris-Nice after final time trial victory". Cycling Weekly. IPC Media Limited. Retrieved 10 March 2013. ^ "Froome-Porte secure 1-2 at Criterium International". Cycling Weekly. IPC Media Limited. 25 March 2013. Retrieved 12 December 2013. ^ Cycling News. "Sutton: Wiggins needs to support a Froome-led Sky at Tour de France". Cyclingnews.com. ^ "Chris Froome may lead Sky's 2013 Tour de France bid with Bradley Wiggins in support". Telegraph.co.uk. 23 October 2012. ^ "Team Sky dominate stage two time trial". aljazeera.com. ^ Barry Ryan. "Puccio takes overall Giro d'Italia lead in Ischia". Cyclingnews.com. ^ Barry Ryan. "Wiggins slides down the pecking order at Giro d'Italia". Cyclingnews.com. ^ William Fotheringham. "Bradley Wiggins' Giro d'Italia hopes go downhill on wet Florence stage". the Guardian. ^ Stephen Farrand. "Wiggins pulls out of the Giro d'Italia". Cyclingnews.com. ^ "Chris Froome wins Tour de Romandie". Cycling Weekly. 28 April 2013. ^ "Chris Froome wins 2013 Criterium du Dauphine". Cycling Weekly. 9 June 2013. ^ "Edvald Boasson Hagen wins Tour of Norway as Team Sky fend off late attacks". SkySports. ^ "Eneco Tour: David Lopez wins stage six from breakaway as Tom Dumoulin takes overall lead". Sky Sports. ^ "David Lopez wins on stage six of the Eneco Tour". Cycling Weekly. 17 August 2013. ^ "Vasil Kiryienka solos to win Vuelta stage 18 as Chris Horner gains time". Cycling Weekly. 12 September 2013. ^ "UCI Road World Championships 2013: Sir Bradley Wiggins and Chris Froome head up Great Britain squad". Telegraph.co.uk. 10 September 2013. ^ Daniel Benson. "UCI Road World Championships 2013: Elite Men Time Trial Results". Cyclingnews.com. Archived from the original on 30 June 2015. Retrieved 15 March 2015. ^ "Earle signs on for 2014 with Team Sky". Cycling News. Future Publishing. 4 June 2013. Retrieved 15 July 2013. ^ "Renshaw, Uran to Omega Pharma-QuickStep". Cycling News. Future Publishing. 1 August 2013. Retrieved 2 August 2013. ^ "Hayman leaves Team Sky for Orica-GreenEDGE". Cycling News. Future Publishing. 21 August 2013. Retrieved 22 August 2013. ^ "Deignan signs for Team Sky". Cycling News. Future Publishing. 6 September 2013. Retrieved 6 September 2013. ^ "Nieve confirms two-year deal with Sky". Cycling News. Future Publishing. 1 October 2013. Retrieved 1 October 2013. ^ "Ten Riders Extend With Team SKY". Team Sky. 23 December 2013. Retrieved 30 December 2013. ^ Cycling News. "Thomas out of Paris-Nice after crash". Cyclingnews.com. ^ Cycling News. "Illness forces Porte out of Tirreno-Adriatico". Cyclingnews.com. ^ Cycling News. "Richie Porte quits Catalunya". Cyclingnews.com. ^ "Richie Porte out of Team Sky squad for 2014 Giro d'Italia". Telegraph.co.uk. 7 April 2014. ^ Cycling News. "Kennaugh out of Giro d'Italia with illness". Cyclingnews.com. ^ "BBC Sport — Froome triumphs in Tour de Romandie after time trial win". BBC Sport. ^ "Bradley Wiggins takes Tour of California for first win of season". the Guardian. ^ "Geraint Thomas seals Bayern Rundfahrt victory as Sam Bennett wins final stage". SkySports. ^ Guardian sport. "Chris Froome crashes in Critérium du Dauphiné but retains lead". the Guardian. ^ ProCyclingStats. "Critérium du Dauphiné 2014 – General Classification". procyclingstats.com. ^ "Team Sky suffer new blow as Zandio abandons Tour". reuters.com. ^ ProCyclingStats. "Tour de France 2014 – General Classification". procyclingstats.com. ^ "BBC Sport — Britain's Peter Kennaugh wins Tour of Austria in Vienna". BBC Sport. ^ Stephen Farrand. "UCI Road World Championships 2014: Men's Elite Individual Time Trial Results — Cyclingnews.com". Cyclingnews.com. ^ Cycling News. "Thomas to continue with Team Sky for two more years". Cyclingnews.com. ^ ProCyclingStats. "Ben Swift". procyclingstats.com. ^ Cycling News. "Edvald Boasson Hagen to leave Team Sky". Cyclingnews.com. ^ "Team Sky sign Leopold König, Nicolas Roche, Wout Poels, Andy Fenn, Lars Petter Nordhaug". SkySports. ^ Cycling News. "Astana sign Cataldo from Team Sky". Cyclingnews.com. ^ Sky, Team. "Team Sky". ^ "Dombrowski Q&A: Moving to Cannondale, time with Sky, and surgery". VeloNews.com. ^ Cycling News. "Wiggins signs with Team Sky until Paris-Roubaix". Cyclingnews.com. ^ Zeb Woodpower. "2015 starts with a bang for Richie Porte". Cyclingnews.com. ^ "Ian Stannard wins Omloop Het Nieuwsblad for second year in a row". SkySports. ^ Cycling News. "Omloop Het Nieuwsblad Elite 2015: Results — Cyclingnews.com". Cyclingnews.com. ^ "Paris — Nice 2015: Stage 4 Results". Cyclingnews.com. ^ ProCyclingStats. "Paris — Nice 2015 – Stage 4". procyclingstats.com. ^ Cycling News. "Crashes nearly spell disaster for Sky in Paris-Nice". Cyclingnews.com. ^ "Paris — Nice 2015: Stage 7 Results". Cyclingnews.com. ^ ProCyclingStats. "Paris — Nice 2015 – Stage 7 (ITT)". procyclingstats.com. ^ "E3 Harelbeke 2015: Results". Cyclingnews.com. ^ "Team Sky — Thomas caps a day to remember". teamsky.com. Archived from the original on 30 March 2015. Retrieved 27 March 2015. ^ "Settimana Internazionale di Coppi e Bartali 2015: Stage 2 Results". Cyclingnews.com. ^ "Team Sky — Super Swift wins to take lead". teamsky.com. Archived from the original on 30 March 2015. Retrieved 27 March 2015. ^ "Volta Ciclista a Catalunya 2015: Stage 5 Results". Cyclingnews.com. ^ "Team Sky — Wind blows Porte into lead". teamsky.com. Archived from the original on 31 March 2015. Retrieved 27 March 2015. ^ Alasdair Fotheringham. "Volta Ciclista a Catalunya 2015: Stage 7 Results". Cyclingnews.com. ^ "Volta a Catalunya: Richie Porte seals victory as Alejandro Valverde wins final stage". Sky Sports. ^ "Team Sky — Porte clinches Catalunya title". teamsky.com. Archived from the original on 1 April 2015. Retrieved 29 March 2015. ^ Stephen Farrand. "Driedaagse De Panne-Koksijde 2015: Stage 3b Results". Cyclingnews.com. ^ Barry Ryan. "Wiggins bids Team Sky adieu at Paris-Roubaix". Cyclingnews.com. ^ Kirsten Frattini. "Giro del Trentino 2015: Stage 4 Results". Cyclingnews.com. ^ Stephen Farrand. "Porte takes charge at the Giro del Trentino". Cyclingnews.com. ^ "Tour de Romandie 2015: Stage 1 Results". Cyclingnews.com. ^ Cyclingnews. "News shorts: LottoNL-Jumbo, BMC confirm Tour de Yorkshire teams". Cyclingnews.com. ^ Peter Cossins. "Tour de Yorkshire favourite Swift crashes out". Cyclingnews.com. ^ Cycling News. "Swift to undergo surgery after Tour de Yorkshire crash". Cyclingnews.com. ^ Alasdair Fotheringham. "Giro d'Italia: Porte loses time to Contador and Aru with late puncture on stage 10". Cyclingnews.com. ^ Barry Ryan. "Giro d'Italia: Richie Porte docked two minutes". Cyclingnews.com. ^ Alasdair Fotheringham. "Contador expresses sympathy for Porte after Sky rider docked time". Cyclingnews.com. ^ Barry Ryan. "Giro d'Italia: Porte and Urán limit damage at Monte Berico". Cyclingnews.com. ^ Cycling News. "Crash upsets general classification on Giro d'Italia stage 13". Cyclingnews.com. ^ Cycling News. "Richie Porte abandons Giro d'Italia". Cyclingnews.com. ^ "Critérium du Dauphiné 2015: Stage 1 Results". Cyclingnews.com. ^ "Critérium du Dauphiné 2015: Stage 7 Results". Cyclingnews.com. ^ Cycling News. "Critérium du Dauphiné 2015: Stage 8 Results". Cyclingnews.com. ^ Cycling News. "Froome: We've got the strongest Tour de France team we've ever had". Cyclingnews.com. ^ ProCyclingStats. "Tour de France 2015 – Stage 10". procyclingstats.com. ^ "Porte says that he was 'punched' in the Pyrenees". VeloNews. ^ "Froome: Spectator Threw Urine In My Face". Sky News. ^ Cycling News. "Porte confirms he will leave Team Sky". Cyclingnews.com. ^ "Porte confirmed with BMC for 2016". Cyclingnews.com. ^ Cycling News. "Team Sky add Geoghegan Hart and Peters as stagiaires". Cyclingnews.com. ^ Cycling News. "Landa confirms transfer to Team Sky in 2016". Cyclingnews.com. ^ Cycling News. "Transfer news: Mikel Nieve extends with Team Sky". Cyclingnews.com. ^ Cycling News. "News shorts: Boeckmans out of hospital, Moscon to Team Sky". Cyclingnews.com. ^ "Team Sky sign Michal Golas from Etixx – Quick-Step". Sky Sports. ^ Cycling News. "Danny van Poppel signs for Team Sky". Cyclingnews.com. ^ Cycling News. "Intxausti signs for Team Sky". Cyclingnews.com. ^ "Michal Kwiatkowski signs for Team Sky from Etixx – Quick-Step". Sky Sports. ^ "Team Sky – Team Sky 2016 squad confirmed". Archived from the original on 28 September 2015. Retrieved 28 September 2015. ^ "Vasil Kiryienka takes surprise win in men's time trial at World Championships – Cycling Weekly". Cycling Weekly. 23 September 2015. ^ "Peter Kennaugh wins Cadel Evans Great Ocean Road Race". Cycling Weekly. 31 January 2016. ^ "Wout Poels wins Volta a la Comunitat Valenciana on a 'double day' for Team Sky – Cycling Weekly". Cycling Weekly. 7 February 2016. ^ Cycling News. "Volta a la Comunitat Valenciana 2016: Stage 1 Results – Cyclingnews.com". Cyclingnews.com. ^ "Team Sky's Chris Froome wins Herald Sun Tour in Australia". the Guardian. ^ "Geraint Thomas wins the Volta ao Algarve". Cycling Weekly. 21 February 2016. ^ "Geraint Thomas stages remarkable comeback to hold off Alberto Contador and win Paris-Nice". Cycling Weekly. 13 March 2016. ^ "Kwiatkowski defeats Sagan at E3". VeloNews.com. ^ Cycling News. "Milan-San Remo 2016: Results – Cyclingnews.com". Cyclingnews.com. Archived from the original on 20 March 2016. ^ "Tour of Flanders 2016". Cyclingnews.com. Archived from the original on 21 April 2016. Retrieved 24 April 2016. ^ "Australian Hayman secures shock Paris-Roubaix victory". euronews. ^ Cycling News. "Kwiatkowski flops after hard Team Sky graft at Amstel Gold Race". Cyclingnews.com. ^ "Wout Poels wins Liège-Bastogne-Liège, Team Sky's first Monument – Cycling Weekly". Cycling Weekly. 24 April 2016. ^ "Mikel Landa takes bonus seconds to seal overall win at Giro del Trentino". Cycling Weekly. 22 April 2016. ^ "Doull and Geoghegan Hart part of Team Sky's 'second generation', says Brailsford – Cycling Weekly". 24 August 2016. ^ a b c "Cycling transfers 2017: All the ins and outs from the WorldTour – Cycling Weekly". 24 August 2016. ^ "Team Sky confirm signing of Etixx-Quick Step rider – Cycling Weekly". 25 August 2016. ^ "Team Sky sign Kenny Elissonde". Cyclingnews.com. ^ "Wout Poels signs new long-term deal with Team Sky – Cycling Weekly". 30 September 2016. ^ "Viviani extends Team Sky stay". 26 October 2016. ^ "Diego Rosa joins Team Sky". Team Sky. 27 October 2016. ^ "Jon Dibben signs for Team Sky". Team Sky. 8 November 2016. ^ "Sagan, Movistar top final UCI WorldTour rankings". Cyclingnews.com. Immediate Media Company. 1 October 2016. Retrieved 11 September 2017. ^ "Henao wins Paris-Nice as Contador comes up just short". Cyclingnews.com. Immediate Media Company. 12 March 2017. Retrieved 12 March 2017. ^ "Milan-San Remo: Team Sky rider Michal Kwiatkowski wins sprint finish". BBC Sport. BBC. 18 March 2017. Retrieved 11 September 2017. ^ Robertshaw, Henry (20 May 2017). "Jon Dibben wins Tour of California time trial as Rafal Majka slips out of yellow". Cycling Weekly. Time Inc. UK. Retrieved 11 September 2017. ^ "General classification 7" (PDF). Matsport.fr. Matsport Timing. 20 May 2017. Retrieved 20 May 2017. ^ "Giro d'Italia 2017: Geraint Thomas and Mikel Landa to share Team Sky leadership". BBC Sport. BBC. 28 April 2017. Retrieved 11 September 2017. ^ Windsor, Richard (14 May 2017). "Nairo Quintana wins on Blockhaus as Giro d'Italia stage nine marred by motorbike crash". Cycling Weekly. Time Inc. UK. Retrieved 14 May 2017. ^ Fletcher, Patrick (17 May 2017). "Giro d'Italia: Fraile cleans up in Bagno di Romagna". Cyclingnews.com. Immediate Media Company. Retrieved 17 May 2017. ^ Benson, Daniel (26 May 2017). "Giro d'Italia: Landa finally gets his win in Piancavallo". Cyclingnews.com. Immediate Media Company. Retrieved 26 May 2017. ^ "Tom Doumoulin wins the Giro d'Italia". Cyclingnews.com. Immediate Media Company. 28 May 2017. Retrieved 28 May 2017. ^ O'Shea, Sadhbh (23 May 2017). "Nibali wins queen stage of Giro d'Italia". Cyclingnews.com. Immediate Media Company. Retrieved 23 May 2017. ^ "Hammer Series 2017: Hammer Chase Results - Cyclingnews.com". ^ "Denmark's Fuglsang wins Dauphiné". VeloNews. Competitor Group. Agence France-Presse. 11 June 2017. Retrieved 11 June 2017. ^ "Dauphiné: Porte punishes Froome, Kennaugh takes stage". VeloNews. Competitor Group. 10 June 2017. Retrieved 11 June 2017. ^ "Team Sky announce Tour de France lineup". Team Sky. 22 June 2017. Retrieved 11 September 2017. ^ "Kwiatkowski agrees new three-year deal with Team Sky". Cyclingnews.com. 8 August 2017. Retrieved 8 August 2017. ^ "Teuns wins Tour de Pologne". Cyclingnews.com. Immediate Media Company. 7 August 2017. Retrieved 11 September 2017. ^ Wynn, Nigel (5 August 2017). "Mikel Landa secures overall win in 2017 Vuelta a Burgos". Cycling Weekly. Time Inc. UK. Retrieved 11 September 2017. ^ "Chris Froome confirms new contract with Team Sky". Team Sky. 30 June 2017. Retrieved 30 June 2017. ^ "Castroviejo joins Team Sky from Movistar for 2018 - Cyclingnews.com". ^ "De la Cruz signs for Team Sky - Cyclingnews.com". ^ "Egan Bernal signs for Team Sky - Cyclingnews.com". ^ Sky, Team. "Young sprint talent Kristoffer Halvorsen joins Team Sky - Team Sky". www.teamsky.com. ^ Sky, Team. "L'Avenir winner Egan Bernal joins Team Sky - Team Sky". www.teamsky.com. ^ Sky, Team. "Chris Lawless signs for Team Sky - Team Sky". www.teamsky.com. ^ Sky, Team. "Van Baarle joins Team Sky - Team Sky". www.teamsky.com. ^ Sky, Team. "Team Sky 2018 roster complete with signing of Leonardo Basso - Team Sky". www.teamsky.com. ^ Association, Press (15 August 2017). "Mikel Landa to leave Team Sky and join Nairo Quintana at Movistar in 2018" – via The Guardian. ^ "Mikel Nieve signed by Orica-Scott for 2018 - Cycling Weekly". 3 August 2017. ^ "Peter Kennaugh announces Team Sky departure for two-year deal with Bora-Hansgrohe". ^ "Ian Boswell to leave Team Sky to join Katusha-Alpecin for 2018 - Cycling Weekly". 10 August 2017. ^ "Elia Viviani ends Team Sky contract to join Quick-Step Floors - Cyclingnews.com". ^ Sky, Team. "Knees pens two-year extension - Team Sky". www.teamsky.com. ^ Sky, Team. "Stannard signs new deal with Team Sky - Team Sky". www.teamsky.com. ^ Sky, Team. "Golas signs new deal - Team Sky". www.teamsky.com. ^ Sky, Team. "Deignan looking forward to 2018 after strong year - Team Sky". www.teamsky.com. ^ Sky, Team. "Henao hopes to keep developing - Team Sky". www.teamsky.com. ^ Sky, Team. "Lopez looking to impart wisdom - Team Sky". www.teamsky.com. ^ "UCI Cycling Gala: the best road cyclists honoured in Guilin". www.uci.ch. ^ "Bernal wins Colombian time trial title". www.efe.com. ^ Sky, Team. "Henao seals second successive Colombian road race title". www.teamsky.com. ^ "Egan Bernal wins Colombia Oro y Paz; Ewan claims Almeria: Daily News Digest". CyclingTips. ^ "Giro d'Italia 2018 - Stage 6 - Results". www.procyclingstats.com. ^ "Giro d'Italia 2018 - Stage 9 - Results". www.procyclingstats.com. ^ "Giro d'Italia 2018 - Stage 13 - Results". www.procyclingstats.com. ^ "Giro d'Italia 2018 - Stage 14 - Results". www.procyclingstats.com. ^ "Giro d'Italia 2018 - Stage 15 - Results". www.procyclingstats.com. ^ "Giro d'Italia 2018 - Stage 16 (ITT) - Results". www.procyclingstats.com. ^ "Giro d'Italia 2018 - Stage 18 - Results". www.procyclingstats.com. ^ Cary, Tom (26 May 2018). "Chris Froome on verge of victory at Giro d'Italia to seal one of the most amazing comebacks in cycling history" – via www.telegraph.co.uk. ^ "How Chris Froome won Giro d'Italia thanks to 'spectacular' stage 19 victory". 5 June 2018 – via www.bbc.co.uk. ^ Weekly, Cycling (23 December 2018). "Why Chris Froome's Giro d'Italia win was the best Grand Tour victory of 2018". Cycling Weekly. ^ Press, Associated (10 June 2018). "Geraint Thomas wins Critérium du Dauphiné ahead of Adam Yates" – via www.theguardian.com. ^ "Tour de France 2018 - Stage 7 - Results". www.procyclingstats.com. ^ "Tour de France 2018 - Stage 10 - Results". www.procyclingstats.com. ^ "Tour de France 2018: Thomas wins Stage 11, riding into yellow". Cyclist. ^ "Tour de France Stage 12: Thomas wins again on Alpe d'Huez". Cyclist. ^ "Tour de France 2018 - Stage 12 - Results". www.procyclingstats.com. ^ Whittle, Jeremy (22 July 2018). "Team Sky's Gianni Moscon kicked off Tour de France for striking opponent". The Guardian. ISSN 0261-3077. Retrieved 9 April 2019. ^ Ryan, Barry. "Gianni Moscon disqualified from Tour de France". www.cyclingnews.com. Retrieved 9 April 2019. ^ "Tour de France 2018 - Stage 17 - Results". www.procyclingstats.com. ^ "Tour de France 2018 - Results". www.procyclingstats.com. ^ "La Vuelta ciclista a España 2018 - Results". www.procyclingstats.com. ^ Weekly, Cycling (15 September 2018). "Gianni Moscon makes winning return to racing with victory at Coppa Agostoni". Cycling Weekly. ^ Sky, Team. "Moscon takes Toscana victory". www.teamsky.com. ^ BrownOctober 21, Gregor; 2018 (21 October 2018). "Moscon ends season on Guangxi high, aims for 2019 Giro". ^ a b Sky, Team. "Team Sky to become Team INEOS". www.teamsky.com. ^ Weekly, Cycling (22 November 2018). "'Helping Froome and Valverde win Grand Tours has been a privilege'". Cycling Weekly. ^ a b "New sponsor for Team Sky". Team Sky. BSkyB. 25 June 2013. Retrieved 26 June 2013. ^ Richard Tyler (9 October 2009). "Pinarello named as Team Sky bike sponsor". Cyclingnews.com. ^ "Sponsors: Pinarello". Team Sky. Retrieved 22 March 2010. it's the first racing frame to boast an asymmetric frame. Introducing the Dogma 60.1: designed and crafted by Pinarello. ^ "Team Sky Show Off Their Pinarello Dogmas". BikeRadar. 11 December 2009. Retrieved 1 January 2012. ^ "Adidas unveils apparel partnership with Team Sky – Sports Sponsorship news – Miscellaneous". SportsPro Media. Retrieved 1 January 2012. ^ "Pro Cycling | Latest News | Team Sky go green for Tour". Team Sky. 30 June 2011. Archived from the original on 5 September 2011. Retrieved 17 January 2015. ^ Sky, Team. "Sky Ocean Rescue Tour De France kit revealed - Team Sky". www.teamsky.com. ^ "Team Sky to continue riding Pinarello bikes until at least 2020 – Cycling Weekly". 19 July 2016. ^ "Castelli partnership announced". 3 November 2016. ^ "Team Sky set 2019 Tour de France as deadline to find new sponsors". cyclingnews.com. 12 December 2018. Retrieved 12 December 2018. ^ "Why now and what now? The big questions facing Team Sky". BBC Sport. 12 December 2018. Retrieved 13 December 2018. ^ "Pinarello extends Team Sky partnership". Team Sky. BSkyB. 27 August 2013. Retrieved 27 August 2013. ^ Sky, Team. "Page not found – Team Sky". ^ "Team Sky – Stages Cycling". Archived from the original on 4 May 2016. Retrieved 3 January 2017. ^ "CNP and Team SKy Win Sports Nutrition Award". www.cnpprofessional.co.uk. 4 March 2014. Retrieved 1 March 2018. ^ "Team Sky to use Wahoo Kickr power trainers". BikeRadar. Retrieved 24 August 2017. ^ "The Finances of Team Sky". inrng.com. ^ "Team Sky report budget of £31 million in 2016 - Cyclingnews.com". ^ "Road to Glory". SkySports. ^ Chris Harvey (22 November 2012). "Bradley Wiggins: a Year in Yellow, Sky Atlantic, review". Telegraph.co.uk. ^ Matt, Slater (30 October 2012). "Team Sky strive for cycling's moral high ground". BBC Sport. BBC. Retrieved 11 March 2015. ^ Owen Gibson (20 October 2012). "Doping expert wants Team Sky's drug stance put under the microscope". The Guardian. Retrieved 24 July 2013. ^ Wynn, Nigel (18 October 2012). "Team Sky riders and staff must sign anti-doping policy". Cycling Weekly. IPC Media. Retrieved 26 June 2013. ^ Magnay, Jacquelin (25 January 2013). "Former Team Sky doctor Geert Leinders interrogated in Belgian doping inquiry". The Telegraph. Retrieved 2 May 2013. ^ "Dave Brailsford: Team Sky to take short-term pain for long term-gain". BBC Sport. BBC. 6 November 2012. Retrieved 26 June 2013. ^ Magnay, Jacquelin (5 November 2012). "World Anti-Doping Agency chief David Howman attacks Team Sky for zero-tolerance policy towards drug cheats". The Telegraph. Retrieved 4 February 2013. ^ Telegraph Sport (13 March 2013). "Dave Brailsford hits back at insinuation that Team Sky's success is built on use of performance-enhancing drugs". The Telegraph. Retrieved 2 May 2013. ^ "Jonathan Tiernan-Locke: Team Sky cyclist in UCI inquiry". BBC Sport. BBC. 29 September 2013. Retrieved 20 March 2014. ^ a b "Team Sky's Jonathan Tiernan-Locke to face anti-doping hearing". BBC Sport. BBC. 17 December 2013. Retrieved 20 March 2014. ^ Cycling News. "Tiernan-Locke banned for two years". Cyclingnews.com. ^ Westby, Matt (19 March 2014). "Sergio Henao withdrawn from racing by Team Sky amid concern over test results". Sky Sports. BSkyB. Retrieved 20 March 2014. ^ "Henao to return to racing". Team Sky. Team Sky. 13 June 2014. Retrieved 27 June 2014. ^ Daniel Benson & Patrick Fletcher. "UCI opens biological passport case against Sergio Henao". Cyclingnews.com. ^ Cycling News. "Team Sky: We believe in Sergio Henao". Cyclingnews.com. ^ "Chris Froome returns adverse analytical finding for salbutamol - Cyclingnews.com". ^ "UCI statement on anti-doping proceedings involving Mr Christopher Froome". www.uci.org. ^ Sky, Team. "Team Sky welcome Froome verdict - Team Sky". www.teamsky.com. ^ Poulson, Kevin. ""Mueller Finally Solves Mysteries About Russia's 'Fancy Bear' Hackers"". The Daily Beast. ^ a b "Froome has 'no issues' with leaked TUE data from WADA hack". Cyclingnews.com. ^ a b "Wiggins spokesperson on WADA leak: 'There's nothing new here'". Cyclingnews.com. ^ "Tour de France winners Froome and Wiggins named in confirmed 'Fancy Bear' WADA hack". Cyclingnews.com. ^ "Cope: I don't know what was in the package for Team Sky". Cyclingnews.com. ^ "British Cycling physio faces questions over Team Sky's Dauphine medical package". Cyclingnews.com. ^ "UKAD ramps up investigation into Team Sky and British Cycling". Cyclingnews.com. ^ "Parliament to look into Wiggins 'mystery package' – News shorts". Cyclingnews.com. ^ "Cookson calls on Team Sky to give full disclosure of contents of mysterious Jiffy bag". Cyclingnews.com. ^ "British Cycling warned about Team Sky relationship months before Cope's delivery". Cyclingnews.com. ^ "Brailsford says mysterious package contained legal drug Fluimucil". Cyclingnews.com. ^ "British Cycling deny knowledge of mystery package contents". Cyclingnews.com. ^ "Daily Mail claims Brailsford tried to 'kill' the mystery package story". Cyclingnews.com. ^ "British Cycling admits failures in Wiggins medical delivery". Cyclingnews.com. ^ "Brailsford explains Fluimucil delivery, insists there was no anti-doping rule violation". Cyclingnews.com. ^ "Exclusive: Team Sky riders consider asking Brailsford to resign". Cyclingnews.com. ^ "Team Sky riders voice support for Brailsford". Cyclingnews.com. ^ "Former Team Sky rider admits violating no-needle rule". Cyclingnews.com. ^ "Josh Edmondson: Anti-doping body to assess ex-Team Sky rider claims". 17 March 2017 – via www.bbc.co.uk. ^ "UCI asks UKAD to assess former Sky rider Edmondson's injection claims". Cyclingnews.com. ^ "No doping charges to be brought against Team Sky or British Cycling in 'impossible' Jiffy bag investigation - Cycling Weekly". 15 November 2017. ^ "British Cycling and Team Sky issue statements in reaction to UKAD 'Jiffy bag' investigation - Cycling Weekly". 15 November 2017. ^ "Bradley Wiggins tells BBC he '100% did not cheat' - Cyclingnews.com". ^ "Chris Froome firm in support of Brailsford - Cyclingnews.com". ^ "Geraint Thomas: We've never even joked about corticosteroid use at Team Sky - Cyclingnews.com". ^ "Eisel: I'm more concerned with losing Cavendish than a Team Sky story from years ago - Cyclingnews.com". ^ "Landis: I can't see Team Sky surviving to the Tour de France - Cyclingnews.com". ^ a b "Velo Awards: Best men's team, best support rider: Sky and Richie Porte – VeloNews.com". VeloNews.com. ^ Alex Richards (30 October 2013). "Chris Froome wins the Velo d'Or for best rider of 2013 following Tour de France triumph". mirror. ^ "Team Sky – Dogma F8 wins London Design Award". ^ "Pinarello, Jaguar and Team Sky win Gold at the 2014 London Design Awards". ^ "Pinarello Dogma F8". 2014 London Design Awards. ^ "Team Sky – Jaguar and Team Sky win award". ^ "Jaguar and Team Sky win 'Best use of PR' accolade at the European Sponsorship Association Excellence Awards". ^ Cycling News. "Sky voted Best Male Team of 2015 in Cyclingnews Reader Poll". Cyclingnews.com. ^ Cycling News. "Team Sky wins male team of the year in Cyclingnews Reader Polll". Cyclingnews.com. ^ "Team Sky wins Best Men's Team in 2017 Cyclingnews Reader Poll - Cyclingnews.com". ^ a b "The 2015 CT Awards: the season's best performers". ^ Cycling News. "Froome's Mont Ventoux run named Moment of the Year in Cyclingnews Reader Poll". Cyclingnews.com. ^ Cycling News. "Froome tops Sagan as Best Male Rider in 2017 Cyclingnews Reader Poll". Cyclingnews.com. ^ Cycling News. "Chris Froome wins Cyclingnews Rider of the Year in 2017 Reader Poll". Cyclingnews.com. ^ "Froome adds Sportsman of the Year award to stunning 2017". 7 December 2017. ^ Cary, Tom (17 October 2017). "Froome, the all-time great" – via www.telegraph.co.uk. Brailsford, Dave; Froome, Chris (2013). The Pain and the Glory: The Official Team Sky Diary of the Giro Campaign and Tour Victory. London: HarperCollins UK. ISBN 978-0-00-754471-4. Edworthy, Sarah; Brailsford, Dave (2012). 21 Days to Glory: The Official Team Sky Book of the 2012 Tour de France. London: HarperCollins UK. ISBN 978-0-00-750661-3. Moore, Richard (2012). Sky's the Limit: Wiggins and Cavendish: British Cycling's Quest to Conquer the Tour de France. London: HarperCollins UK. ISBN 978-0-00-734183-2. Team Sky (2014). The Team Sky Cycling Bible. London: HarperCollins UK. ISBN 978-0-00-754473-8. 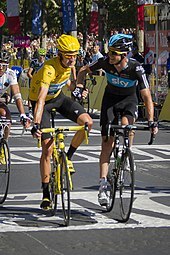 Wikimedia Commons has media related to Team Sky.